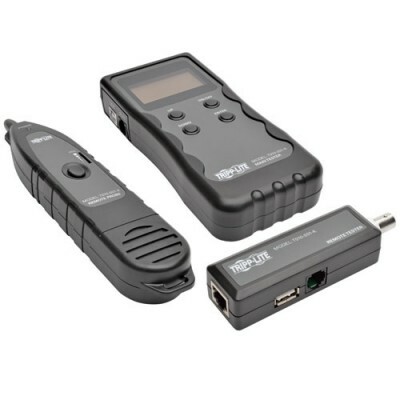 The T010-001-K Multi-Function Cable Tester is an essential tool for cable installers or anyone working in telecom or LAN environments. It allows you to test RJ45 (STP/UTP), RJ11, BNC and USB cable wiring, length, fault and location, as well as common metal wires using the included alligator clip adapter. For instance, you can test wiring for open, short, cross, reverse and pairing connection. You can also track the location of an open circuit position, and determine the length of a cable â€“ whether in a wall or on a spool â€“ up to 4,920 feet (1,500 meters). The easy-to-read LCD interface includes a calibration function that lets you load saved data. Powered by included 9-volt batteries, the T010-001-K can find an RJ45, RJ11, BNC or USB cable nestled within a group of cables. The auto-off function preserves battery power. The probe unitâ€™s LED flashlight is handy for working in dark areas. Included headphones help you work in noisy areas. When not in use, the T010-001-K can be stored in its carrying case.